As I stand by the stove stirring the dark, luscious chocolate into this warm chili I can't help but feel a little like Vianne Rocher, concocting her alluring, exotic birthday feast. Outside the wind has picked up and blown the first icy fingers of winter into town and, as the rich chocolate melts smoothly into this opulent chili, I watch as misty waves of fine crystalline snowflakes blow past my window. It may sound unusual to add chocolate to a savoury chili, but in fact, it's a very common ingredient in sauces and stews from Mexico, where chocolate has long been used as a seasoning. In ancient times, when the "New World" was still new, cacao was the treasured "food of the gods." It was revered for it's energizing, stimulating, and aphrodisiac qualities, and was so precious it was used as currency. It wasn't until the 16th century when Spanish explorers, seduced by this enigmatic bean, brought it home to Spain, sweetened it and turned it over to the Swiss who transformed it into the opulent confection it is today. On a side note: Peanuts are also very common in authentic mole sauces, and sometimes enchilada sauce, which is why I always make my Mexican sauces at home. And peanut butter is often used in chili, as well. We are very careful about the Mexican food we eat out. Always ask for an allergen menu if you are allergic. The primary spices in this chili are allspice, coriander, and a basic red chili powder - all common to central Mexico. 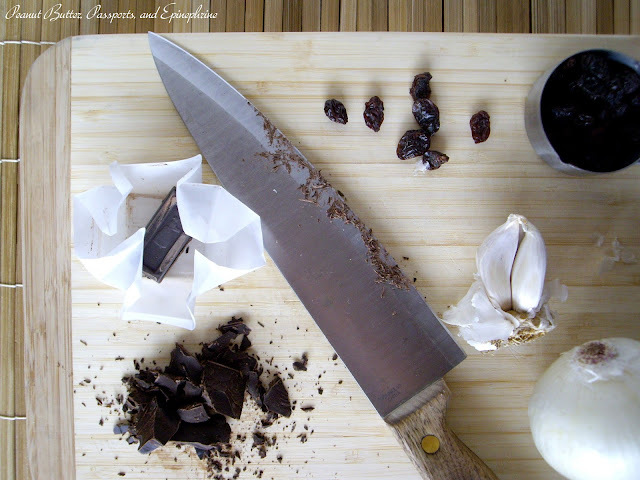 The chocolate fits seamlessly into the blend and adds a luscious, slightly bitter mouth feel. (I use unsweetened Baker's Chocolate from Canada which is safe for those with peanut allergies.) To balance the bitterness I add a handful of raisins, chopped very fine. The combination is perfect. This dish is all about layers upon layers of complex flavours simmered together slowly. I made this batch in the slow cooker, but it can just as easily be made in a heavy pot on the stove top. 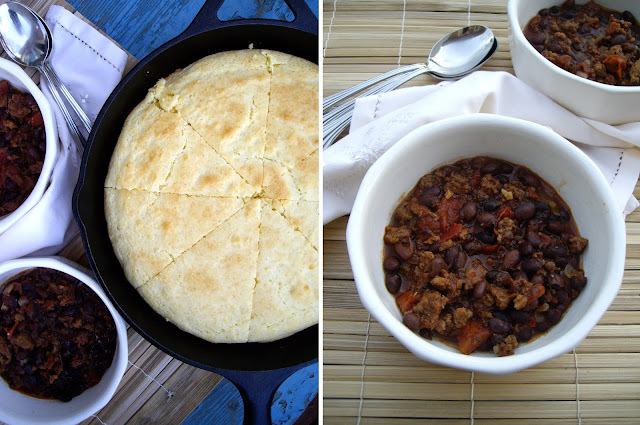 Serve with warm skillet corn bread, traditional Mexican-style tortilla chips, or a rolled flour tortilla. Top with crumbled queso fresco. Crumble and brown the meat in the coconut oil. When the meat begins to caramelize add the onions and garlic and cook, scraping the bottom of the pan, until the onions are soft. You want to develop as much flavour as possible so cook until the meat is quite brown. Transfer the mixture to a large slow cooker and stir in the remaining ingredients. Cover and cook on high for 1 hour, then turn the slow cooker to low and cook for and additional 4 - 5 hours. Alternately, heat a large, heavy pot or dutch oven over medium-high heat. Proceed as above. Cover and simmer gently for 2 - 3 hours. Place a 10 inch cast iron skillet in the cold oven. Preheat the oven and the pan to 375 F (190 C). Melt 4 Tbsp of butter, and set aside to cool. In a large bowl, whisk the flour, corn meal, sugar, baking powder, and salt. In a small bowl whisk the milk with the egg. Stir the milk and butter into the flour. Carefully remove the hot pan from the oven. Place the remaining tablespoon of butter in the pan and quickly spread it around with a pastry brush. Pour the batter into the pan and smooth the top. Place back in the oven and bake 25 - 30 minutes, until the top is golden and firm. Cut into 8 - 10 wedges and serve warm. Sounds soo good! Where do you get your peanut free coconut oil? "We follow a strict sanitation policy - special sanitation procedures are employed during production hours (for example: switching from one product to another, non kosher to kosher or non organic to organic, etc). As per our written sanitation programs, all equipment is exchanged for cleaned and sanitized equipment or the existing equipment is cleaned and sanitized prior to use. We're confident that our sanitation procedures would not allow for cross-contamination, but it depends on the level of sensitivity that your customer has to very trace amounts of potential allergens." We've never had a problem with their coconut oil; however, I recently found Jarrow Formulas Extra Virgin Coconut Oil which states on the label: No wheat, no gluten, no soybeans, no dairy, no egg, no fish/shellfish, no peanuts. They do say contains: tree nuts (coconut). I don't know if it has been processed with other tree nuts. I'll email before we start using it. I buy it at Natural Grocers / Vitamin Cottage here in CO. But I imagine it's available at any health food store. You can always substitute olive oil for the coconut oil if you can't find one that will work for your family. Hope that helps! Thank you so much, Rebecca! I haven't used coconut oil because I hadn't found one that wasn't processed in a facility with peanut oil. I'll have to look for those!